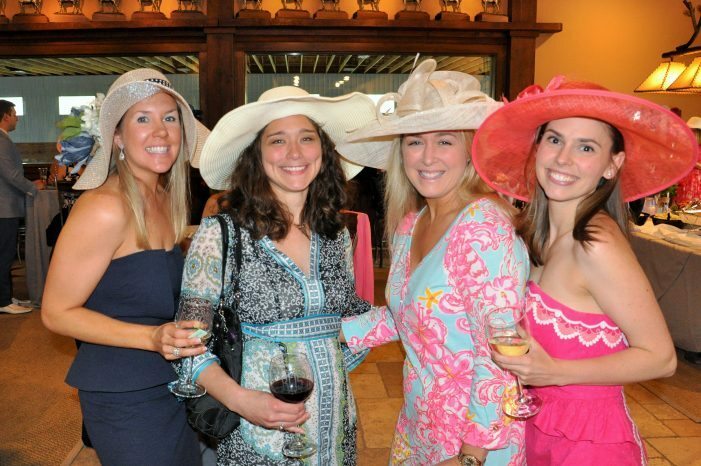 The West Morris Junior Woman’s Club (WMJWC) “Day at the Derby” held on Sat., May 7, at Tranquility Farms in Chester brought more than 75 derby-goers who donned their bow ties and big hats to watch live coverage of “the most exciting two minutes in sports” to raise funds for a wonderful cause. Guests had a chance to win amazing raffle baskets, and bid on unique silent auction items and the “winning horse,” all while noshing on southern fare complete with signature mint juleps. In addition to all the fun that was had, WMJWC’s Day at the Derby raised more than $8,000. This event is the organization’s biggest fundraiser of the year and proceeds from the event will go to serve the community through the many programs the club hosts each year including the Middle School Spelling Bee, the Mendham Seniors St. Patrick’s Day lunch, high school and middle school scholarships, Mendham Seniors Luncheon, Halloween Poster Contest, and the Thanksgiving Food Drive. This year, Juniors will also donate a portion of proceeds from the event to The Valerie Fund’s Thomas J. Rice Grief Support Program. This program offers professional grief support to parents who have lost a child to cancer or a blood disorder. The club would like to thank all of the wonderful sponsors who made the event possible. The West Morris Junior Woman’s Club (WMJWC) is a service organization formed by and for the young women of the West Morris area that has sponsored charitable, educational and civic activities in the surrounding communities since it was founded in 1957.